Over one hundred lawmakers gathered in Washington on Friday along with Iowa Representatives. They are calling for an extension to tax credits that encourage wind energy. The tax credits expired at the end of 2013 were investment and production tax credits which support both on and off shore wind industries. Lawmakers drew up a letter for each stating that the continued job creation and renewable energy promotion would be helpful to the United States and Iowa in particular. Iowa now gets 25% of its electricity from wind energy, more than any other state. The wind industry has created over 80,000 well-paying jobs across America, not to mention the benefits it brings farmers. Many in the Iowa State Capitol believe this is an industry on the move and worth our attention and tax credits. On Monday, March 10th, the US Department of Energy (DOE) in cooperation with the National Renewable Energy Laboratory (NREL) announced that a collaborative grant application submitted by the Iowa Wind Energy Association (IWEA), Windustry, and Wind Utility Consulting with sponsorship from the Iowa Energy Center had been accepted to develop a Midwest & Prairie Regional Wind Resource Center (M&PRWRC). This is a three (3) year grant with up to $487,500 of funding from the DOE and will be administered by NREL. Matching funds, both cash and in-kind, will be provided by the Iowa Energy Center, Windustry, IWEA, Wind on the Wires, and Wind Utility Consulting. The grant anticipates that the center will become self-sustaining after the initial three year period. The M & PRWRC will facilitate regional collaboration and sharing of best practices in the states of Montana, North Dakota, South Dakota, Minnesota, Iowa, Missouri, Wisconsin, Illinois, Indiana and Ohio. Further, the regional resource center will disseminate information about the economic benefits of wind energy to the region, expand and preserve access to quality regional wind resources, and communicate with stakeholder groups to ensure accurate and reliable information about wind energy development. Thanks Iowa Wind Energy for this Wind Power Update. Get your own turbine and benefit right along with the state of Iowa, from Loess Hills Wind Energy, a wind turbine sales, installation and service company. There are a lot of companies to choose from when choosing a wind turbine. With a great reputation, Loess Hills Wind Energy is a company you can depend on. 5,000 jobs will be created soon by a major wind energy project in Kansas and Missouri. Building a system to transport energy from the wind farms to where the power is needed. The originators of the project are taking applicants for workers for this major wind farm project. They expect to spend 2 billion dollars to build the Grain Belt Express Clean Line over a 700 miles of prairie and land from Kansas to as far as Indiana. Most of the jobs will be for constructing the transmission line. Once it is complete, it is thought there will be nearly 500 full-time jobs to remain in place. The plan is for the The Grain Belt Express Clean Line to deliver renewable power from Kansas wind farms to communities in Missouri, Illinois, Indiana and later expanding east. Four questions you should ask before considering a wind turbine. 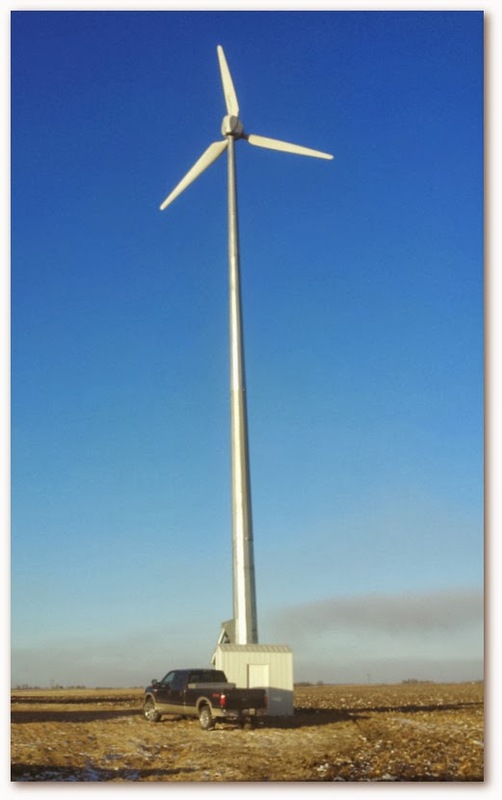 Could the Phoenix 20kW Wind Turbine be right for you? There are several questions someone considering wind power has to ask themselves. First, do you have a spot picked out that is consistently windy. You can check local wind maps to find out just how your area might rate, click here. If your area rates low, because of specific conditions of your area, the ratings might be different. The map does give a generalized idea. The second thing to consider is, how accessible is the site you have chosen for your wind turbine. It is important to make sure that large vehicles can get to the site without too much trouble. The third thing to consider is financing. Are there loans and grants available in your area or for your specific situation? Take a look at a few we have found helpful... click here. The fourth and final question to ask is how does net metering work in your area. Net metering is the process in which utility companies use and reimburse you for electricity you create for the grid you are on. Most utility companies have policies and procedures they follow in regards to this. It is important to know what they are in your area before you place your wind turbine. Once these four questions have been answered you are ready to begin construction of your wind turbine, and begin experiencing the money saving satisfaction of creating your own electricity. At least 15 studies confirm wind energy drives electricity prices down. More than a dozen studies conducted by independent grid operators, state governments, academic experts, and others have found that wind energy benefits consumers by reducing electricity prices: Illinois found that wind energy reduces consumer electricity costs by $177 million per year. Massachusetts found the state Renewable Portfolio Standard has a 3:1 benefit-to-cost ratio, producing annual net benefits of $217 million. Synapse Energy Economics found that doubling wind energy deployment in PJM (Mid-Atlantic and Great Lakes states) beyond existing RPS requirements would save consumers a net $6.9 billion per year, after accounting for all wind and transmission costs. Six peer-reviewed academic studies discussed in this literature review, confirm that wind energy reduces electricity market prices. Charles River Associates found that a wind and transmission investment in the Southwest Power Pool would provide $1 billion in annual consumer savings and net savings of $628 - 728 million per year after accounting for wind and transmission costs. The New England Independent System Operator's wind integration study found that 14% wind energy reduced electricity prices by around 10%, while 24% wind energy reduced electricity prices by 15%. Another Synapse Energy Economics analysis found large investments in wind energy in the MISO (Midwest) region would reduce power supply costs by $3 billion to $9.4 billion per year, or between $63 and $200 per customer per year, after accounting for the cost of transmission. Georgia Tech and Duke University found expanded renewable energy use in the South would reduce energy bills by $14 billion in 2020 and $23 billion in 2030. Colorado's Xcel Energy's wind purchases were found to save consumers $251 million on net, and additional wind = purchases would save a net total of $438 million. The New England Independent System Operator's January 2014 analysis found that the region’s proposed wind projects would reduce electricity market expenses by $1.074 billion per year, or $119 in savings per each MWh of wind energy. Washington, D.C., — A new white paper report finds that wind energy is keeping electric bills low for American homes and businesses, thanks to plummeting wind energy costs driven by technological improvements. The report was compiled by staff at the American Wind Energy Association and uses publicly available data and more than a dozen studies from government, utility, and other independent sources to explore how wind energy affects consumers’ energy bills. A highlight of the report is just-released Department of Energy data showing that consumers in the states that use the most wind energy have fared much better than consumers in states that use less wind energy. Consumers in the top wind energy-producing states have seen their electricity prices actually decrease by 0.37 percent over the last 5 years, while all other states have seen their electricity prices increase by 7.79 percent over that time period. The following chart summarizes how consumers have fared in states that produce more than 7 percent of their electricity from wind (Texas, Wyoming, Oregon, Oklahoma, Idaho, Colorado, Kansas, Minnesota, North Dakota, South Dakota, and Iowa) relative to other states.